In “Built to Last : Successful Habits of Visionary Companies ” Jim Collins repeatedly emphasizes that long-lasting successful companies have a very single-minded focus. But that focus is not stupid or blind. Rather, Collins uses the phrase “Preserve the core / stimulate progress”. This is also the essense of agility. What exactly are the principles? The foundation starts with Trust and Truthfulness. “Truthfulness is the foundation of all human virtues.” Everything we do with agile should be about truthfulness (visibility, transparency) and building trust. All of the other principles and practices associated with Agile Work flow from these basic assumptions about the world. We can’t prove that the above three axioms are “true”. But they either resonate with us or they don’t. If they do, then it will be easy to use these axioms as a checkpoint for all the activities we engage in using Agile Work, wherever we apply it.We are creators… therefore we derive our sense of value from our ability to create. If our creations are accepted by others, our team, our stakeholders or our community, all the better. But fundamentally, this is inherent to us as human beings. However, sometimes this natural drive is suppressed or repressed. In order to activate it, we need to work in empowered teams. Have you ever experienced inspiration or “flow” or joy when working with someone else? Perhaps you were solving a problem. Perhaps you were playing a musical instrument – jamming – and got into a fertile groove. Perhaps you were teaching your children and created the light of understanding in them. Perhaps you built a beautiful set of bookshelves for your home. Or maybe you told a joke that created a brief moment of genuine levity in a group of friends. We are all constantly creating! This basic principle then means that Agile Work methods and practices should not be imposed. Taught to us, perhaps… given to us as a template, perhaps… but once we understand the practices and are familiar with them, we should immediately be given the freedom to use the learning cycle to be creative with the process and practices of Agile Work itself. If we do not participate in creation, we become dis-empowered and that eventually leads to resentment or apathy. Again, the learning cycle comes into play. The guidance, detachment, love, courage and search we go through all help us to build a common understanding of reality. This allows us to see new ways to apply the Agile Work principles and practices that make sense not only to our context, but also to everyone else participating in the work. Change is natural… therefore instead of fighting change, we need to anticipate it, adjust to it, embrace it, and be gracious or even enthusiastic. Not only does change happen to us, but we also instigate change. If things get to boring, whatever the circumstance, we find ways to change things. We rebel at stasis and ennui. Each practice and procedure done in the context of Agile Work must be explicity and implicitly accomodating of change. If a procedure can’t tolerate change it will either lead to a dissonance or conflict… or if we are embracing change, then we will modify or discard the procedure. Our creative nature loves to create, but if we become too attached, too “in love” with our creations, we will support them past their point of relevance. Our latest greatest idea will be good for a while. But eventually change will make it irrelevent. So we see that all three Agile Axioms are also interrelated.Our creations will be washed away through change and if we are lucky or wise we will perceive the change in reality – be truthful to ourselves and others – and allow a new creation to take the place of the old one. When we perceive a certain truth, and try to share that with others, we will be asking those others to change their own perceptions. This change can be difficult and may even require the destruction of a mental model created with love and care over a lifetime. Sensitivity to this loss and encouragement to build a new creation will help build a shared perception… as long as we too are open to new perceptions! And of course, all this foundation of creation, perception and change must be connected to the practical day-to-day reality of our lives. Our family lives, our work lives, our social lives, our volunteer lives, our intellectual lives, our emotional lives, our spiritual lives… our whole lives. These practices provide a starting point. A basic set of activities that will assist you, your team or your organization to advance quickly towards whatever goal you have set for yourselves. The way these practices succeed is by making sure that the Agile Axioms are always remembered and their implications accepted. These practices will set up a virtuous circle by building trust and allowing truthfulness. More trust and truthfulness will allow a fuller and more nuanced expression of the practices…But if these practices become canonized, if they become a rote process imposed and followed blindly, then it means that we have lost sight of the Axioms. We have forgotten to check our practices against the context of creation, perception and change. The reason we follow these practices is because we believe that we are all creators, that we can learn from our diverse perception of reality and that change is a force of growth. We don’t believe these Axioms because we blindly perform these practices. 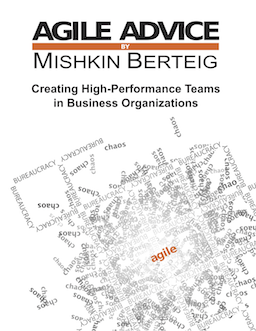 This is all available as a nicely formatted pdf: Agile Axioms – a Brief Exposition.